A green juice consist of a combination of dark leafy green, green sprouts, other vegetables & fruits processed through a juicer. Green juice can also consist of a combination of various dark leafy greens and other vegetables, processed through a juicer. It has to be processed through a juicer, not a blender. Fresh organic green juices supply the body with loads of instant vitamins, minerals, enzymes, antioxidants (like SOD, superoxide dismutase,) and phytonutrients with in minutes of consuming. Green juices contain large quantities of the green pigment known as chlorophyll. Research shows that chlorophyll is almost identical in molecular structure to hemoglobin. Hemoglobin, a molecule in the body, specifically a protein, transports oxygen to tissues and cells throughout the body. Oxygen is necessary for proper and efficient cell function. Providing the body with chlorophyll assist in the production of healthy red blood cells. Chlorophyll also helps in the regeneration of poor blood cells. Chlorophyll has numerous benefits such as a natural detoxifier, cleanser, antiseptic, anticancer properties, intestinal regulation, internal deodorizer, cholesterol reducing, anti-inflammatory, regulating blood sugar and many more. With many of the population facing poor immune system function, chlorophyll is vital in aiding in immune system function. Green juices are very alkalizing. Scientist, doctors, & researchers have found that diseases, illness and inflammation all thrive in an acidic environment. Flooding your body with alkalizing foods and liquids can easily reverse many health challenge prominent in today’s world. What’s The Ratio of Fruit In Green Juices? There is no specific rule on the amount of fruits to greens, its all in your hands. My suggestion for beginners is to start off with 60% fruits to 40% leafy greens and vegetables. Once you are use to juicing, start incorporating more leafy greens and vegetables, ideally 70% greens to 30% fruits. However, do the best you can. What Kind of Greens Should I Use In My Green Juice? Variety is key, never stick to one type of leafy green in your green juices. Mix things up. Leafy greens all have different nutritional components. Your body requires a full spectrum of vitamins, mineral and nutrients. If you use kale one day try collards the next day or add in more than one type of leafy greens. For beginners use leafy greens like spinach, swiss chard and lettuce (Romaine a very popular type, all lettuces are great except iceberg), they offer a much milder taste. Leafy greens: Collard Greens, Kale (Purple, Lacinato, Curry, Green), Swiss Chard, Beet Greens, Dandelion Greens, Arugula, Spinach, Lettuces (all types except iceberg, it has practically no nutritional value) and many more. Full list of ingredients to include in your green juice is at the end of this guide. What Kind Of Fruit Should I Use In My Green Juice? This is up to you, I recommend using fruits that you enjoy, except bananas (won’t juice well). Select firm fruits such as apples, pears, citrus fruits, pineapple, kiwi, cucumbers and berries etc. Why Juice? Why Not Blend Or Chew The Greens? Research shows that a diet high in fruits and vegetables is attributed to a degrease risk for many chronic diseases many Americans face. Yet less than 30% of the US population consumes 2 serving of fruit a day. Fruits and vegetables are filled with many essential nutritional elements needed by the human body. In-order to extract these fluids and nutrients, it is essential to juice them, this process breaks up the cell walls and separates the solids freeing up these valuable nutrients. Fresh juices are rapidly digested and assimilated by the body, in a matter of minutes. Minimal effort is required by the digestive system. Once consumed these vitamins, minerals, antioxidants and enzymes enter the body stream. Solid foods have to be digested over many hours before the nourishment becomes available to the cells and tissue. Its impossible to eat in solid form the large amounts of apples, carrots, greens etc needed. It simple is impossible to eat in solid form the large amounts of fruits and vegetables in your glass. Lets face it in today’s world, many of us don’t have enough time to cook and eat such large quantities of fruits & vegetables. Full detailed article on the benefits of juicing can be found here. 2. Rapid Intake & Assimilation of Vitamins, Minerals, Phytochemicals, Enzymes & Antioxidants In The Body. 9. Improved Hair, Skin and Nails. An apple a day does not keep the doctor away, but a green juice a day will. When Should I Drink My Green Juice? I like to start my day with a quart of fresh green juice, however, if this is not possible its best to consume fresh juices before meals or a few hours after. This allows for proper assimilation of the vitamins and minerals in the juice. Eating a meal and then drinking juice slows down the absorption of nutrient in the juice. This also can cause indigestion, gas, and fermentation. Remember it only takes a few minutes for the body to absorb nutrients from the juice, drink it before a meal and you are all right. How Much Green Juice Should I Drink Each Day? I highly recommend at least a quart (equals a liter) of fresh juice a day. This will allow the body to experience a full blast of benefits. You can make a 16 oz juice in the morning and another 16 oz in the afternoon or evening. Get in a quart of fresh juice and you will easily surpass the recommended daily intake of fruits and vegetables. What Kind of Juicer Do I Need? This all depends on your budget, Juicers range from $90-$2500. An affordable and very easy juicer to use is the Breville Juicer, that’s under $150. However, the Breville isn’t the best with leafy greens. I’ve found that you get more yield of leafy greens with masticating juicers such as the Omega 8005. This juicer typically runs $280. The key is to use what you have now, and when you can invest in a higher end juicer go for it. See this article for more details on the best juicer. How Long Will My Green Juice Keep? Ideally it is best to drink your juice shortly after it is made. Fresh juice begins to deteriorate over time, in-fact breakdown begins 30 minutes after it is pressed. More expensive juicers such as the Norwalk allow juices to keep for up to 3 days. Best rule is to drink within 24 hours, for those that have to prepare juice in advance. Fantastic, now that you have the gist on green juice, get started and let me know how it all goes. If you have any comments or questions, make sure to leave them there. Subscribe to my newsletter below for weekly recipes, tips, and all things juicing. I'm going to have use a blender, as this is all I have and I can't afford to buy a decent juicer at the moment. I do have one my mum gave me, but it takes so long to clean afterwards that I'd rather just use my hand blender. I have a vitamix and I use it for smoothies. It won't juice anything as you are getting all the fiber and other vegetable and fruit solid matter. I do also juice to get in my veggies. I use the vitamix strictly for fruit & vegen protein powder smoothies. Sometimes I do throw in an ounce or two of spinach since the spinach gets destroyed by the vitamix. Spinach is also mild enough that you cannot taste it in a smoothie when there are strong flavored fruits like blueberries, raspberries, strawberries, etc. I have a problem eating vegetables though so I juice them since I can drink 3 pounds of veggies, before juicing, which gives me around 50 ounces of total juice (counting two apples to push the flavor to the sweeter side for my palette. Your web site is great, I can’t wait to start juicing. I have a Bullet….can I use it in place of a juicer…..
You’ll need to reduce the amount of produce and make sure to add water to help it blend if you plan to use a Bullet. I too have a vitamix. Had a juicer but the clean up was so time consuming, I rarely used it. Is the recommended amount (1 qt daily) the same if you are using a vitamix thus getting the roughage? I used to use a juicer. Although it'swork cleaning it after, I enjoyed all of my creations. My question is- I just invested in a vitamix. I kept hearing all these great "juicing" stories when using it. Is this not a good idea? From that juicing 101 it seems this wouldn't be effective. Great recipes for starters,will try them soon.also very helpful do and dont's. Thankyou so much for the heads up. IM a juice virgin – so shopping shall go and juicing I shall do! 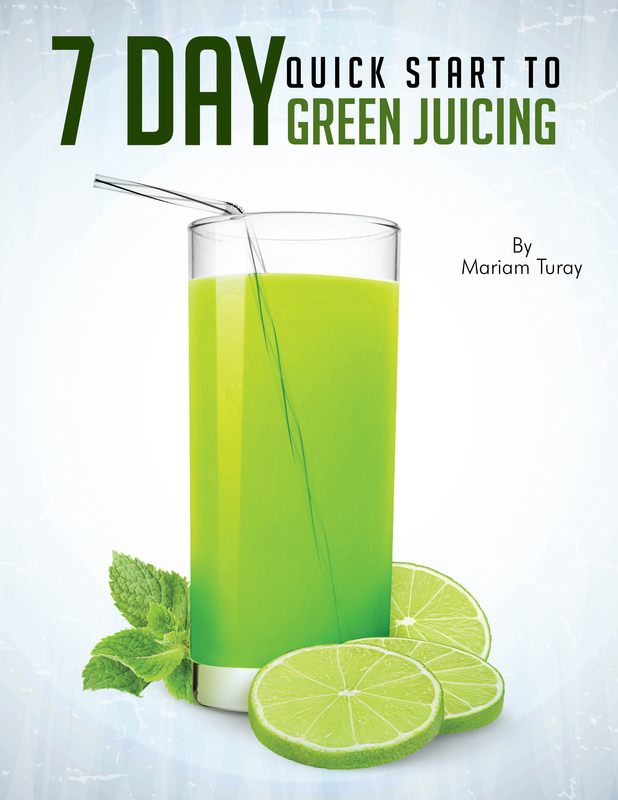 Hi mariam, i really happy to read your articel,im new biginner , i would like to ask you if is it ok to drink green juice while im breathfeeding ? thanks for the info on juicing….but i juice for a week ,dont have time to juice everyday…is this bad for the juicing?? also i put lemon and lime in my juice is this ok. Thanks for reading Sharon. How are you storing your juice? If you are going to juice weekly I would recommend freezing the juices you make immediately after juicing, this will help slow down the breakdown of nutrients. When possible try to juice more often versus weekly, nutrients are much higher when they are freshly pressed. First of all I just want to thank you for the time and effort you spent presenting all of this wonderful information on juicing. Secondly, I am not new to juicing but have only juiced in spurts and most of the time, I don't even think about it. Fortunately, I have had a renewed sense of awareness and appreciation for juicing thanks to your passionate work. So thanks again and I am definitely doing the 30-day juice challenge. So glad to hear. Thanks for joining and being apart of this community. Thank you so much for explaining why you should drink your juice before or a few hours after a meal. I was wondering why sometimes I would have gas throughout the day and some days I would not. I will make sure to drink my juice at the proper times. Thanks again. Being ill has really changed my outlook and settled me into a new way of living. This is the next step gym starts on Monday along with the green juice. Awesome Andrea. Let me know if you have questions along the way. I know you can do it. Thank you for the abundance of information on juicing. I love juicing myself and enjoy reading about it. You present a lot of very thoughtful and insightful information here. Presently I juice every day. I usually have 32 oz. of green juice, but sometimes mix it up with some fruit juice. I try to use what ever is available locally and of course whatever is the freshest. Again, excellent article. Thank you and best wishes! You’re so welcome. Thank you for reading. Cheers! Both the question and the response were what I needed to know. I also recently purchased mason jars (only because it seemed thateveryone was using them) :). It is vertually impossible for me to juice everyday; but I do notice the health benefits of juicing and would like to juice at least one meal a day. I don’t have the best juice; I have a Jack LaLane. I plan to look around to see if I can find a masticating juicer. Thank you so much for sharing you knowledge and I look forward to learning more. Hello Mariam. Thank you for your article. It’s very informative but not overwhelming. I have a masticating Angel juicer, which seems to be the next best juicer to a Norwalk. I’m not able to juice everyday so I make 3- 16 oz bottles and store them in the fridge and drink them over a 24 hour period. Do you think this is ineffective with an Angel juicer? Am I getting at least some nutrients? Also what is the best way to store the juice if I can’t juice a fresh glass each time. Hi Cetana. Thank you for reading my article. You have one of the best juicers in the market. You can store anywhere from 3-7 days with the angel juicer. I recommend no more than 3 days if possible. Minimal nutrients are lost, nothing to really worry about. I like storing my juices in mason jars —> http://amzn.to/ZujpeP The key is to fill your juices to the top. The more air present in your juices the higher the chances of nutrient loss. Another tip to help preserve juices is to add citrus to them, they are all natural preservers.